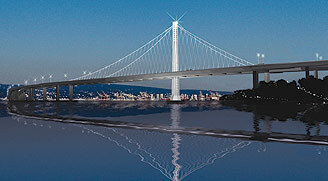 Anchor rods in the tower of the Bay Bridge’s new eastern span are not broken and 99 percent can withstand a major earthquake, Caltrans officials announced today. 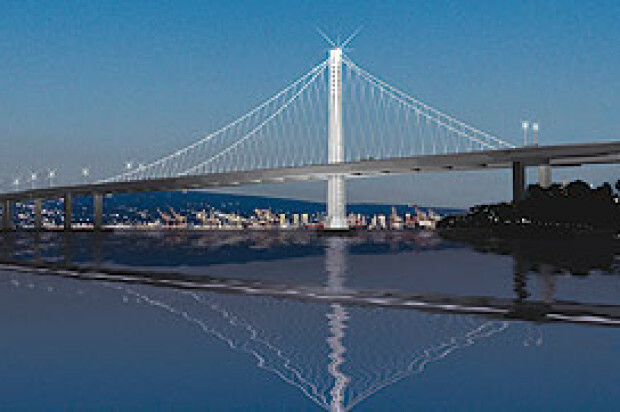 The roughly 25-foot-long steel rods prevent the span’s 525-foot-tall tower from sliding on its concrete and steel foundation during an earthquake. The rods were tested over the last several weeks using a jacking device that grabs and yanks the rods to verify their integrity. Only 408 of the 424 rods in the tower could be tested. Of those tested, 406 were found to be able to withstand a major earthquake. The two rods that didn’t pass the test were removed and sent to a laboratory for further testing, according to Caltrans. Fourteen rods were inaccessible and couldn’t be tested. Concerns were raised about the anchor rods earlier this year when it was discovered that steel tubes surrounding the rods had not been adequately grouted to prevent water from coming in contact with the rods. Early tests showed at least one of the rods was damaged by water. Further testing will be done to determine what long-term impacts the exposure to water could have on the other rods, but for now they have been determined to not be broken.